Welcome Back to redaX16 In the The New MuSic Blog "Zik-Rﭏ16♪"
By the summer of 2004, Nickelback had been on tour around the globe for the better part of the previous 5 years, at that point supporting their third album, The Long Road (which at the time had sold 5 million copies worldwide). The plan was to take some time off to enjoy the fruits of their labor before even thinking about new songs. But two weeks into their vacation Chad, Mike and Ryan started feeling that old familiar urge, so they gathered in Chad's studio near Vancouver to jam. "Once we got in there and started to mess around, we just didn't stop," says Chad. Since Nickelback used Kroeger's studio and co-produced the album with their friend Joey Moi, they were not in a fevered rush to finish up. And, over the next seven months, they spent countless hours making sure every song on their fourth album, All the Right Reasons, was exactly the way they wanted it. The resulting 11 tracks are the most insistent, dynamic and diverse Nickelback has conjured to date. The first single "Photograph" is reflective and earnest, constructed on a foundation of multi-layered vocals, infectious melodies and guitars that build to a triumphant buzz. "Fight For All The Wrong Reasons" echoes with textural guitars and evolves from a moody melody into a crunchy, southern-tinged riff. And "Savin' Me" is a call for redemption that's driven by a combination of ringing and fuzzy guitars, undeniable vocals, gliding strings and delicate piano. "We were a little scared of using piano," admits Kroeger. "We just didn't think it was very rock and roll. It wasn't until we heard piano in a Nickelback song that we all said, 'Yes, we like this and we want to do more of it.' It just complimented the part so well and really showed that we shouldn't be narrow minded about any instrument, no matter what it is or what sort of stigma might be attached to it." Nickelback's eagerness to experiment and evolve lights up All The Right Reasons like a bonfire. While the band's music has always been deeply personal, this time not only have they laid it all bare but they also searched every inch of their sonic spectrum to create an album that appeals on many different levels. "On The Long Road we went in a heavier direction, but with this album we really wanted to show our range and have songs that work for all the diverse fans that go to Nickelback shows and listen to our records," Kroeger says, giving a window into the impetus for his songwriting â¤“ making music for real music fans like him. Nickelback's all-inclusive approach has been a large part of the band's immense success. The Long Road went triple platinum in the U.S. and included the radio hits "Someday," "Figured You Out" and "Feelin' Way Too Damn Good." Their previous disc, 2001's Silver Side Up, was even more successful, selling over 6 million copies in the U.S. and containing three number one hits, "Too Bad," "Never Again" and their mega-successful breakout single, "How You Remind Me," which was the number one Most Played Song of 2002. Joining Nickelback just in time to make All the Right Reasons was new drummer, Daniel Adair. Adair's hard-hitting yet multifaceted style perfectly matched the band's new material, from the foot-to-the-floor stomp and grind of "Animals" to the "lump-in-throat sentiment of "If Everyone Cared." Adair jumped right in to the fold and his 'audition' in Chad's studio even made its way into the finished album. "We are totally thrilled to have Daniel in the band," Chad says. "The creativity that went on with him in the studio was really inspiring. He's a totally amazing player." Over the years, Nickelback's music has appealed to listeners of pop, hard rock, alternative and metal. A number of seemingly disparate celebrity artists have also embraced the band, including ZZ Top guitarist Billy Gibbons and ex-Pantera members Vinnie Paul and the late Dimebag Darrell Abbott. Both Gibbons and Abbot (albeit posthumously) aided in the creation of All the Right Reasons. Nickelback met Gibbons backstage after one of their shows in Colorado and they all immediately hit it off. When a guitar solo was needed on the track "Follow You Home," they asked for Gibbons' help, then flew to Los Angeles to record the part. "I wanted a real different flavor for that solo, and Billy totally nailed it," Chad says. "After he did the guitar part, he actually sang the third verse on the song in that low, gravelly voice of his and we put this distortion effect on it. It's really cool." Gibbons' contribution did not end there, he also lent backing vocals to the track "Rock Star." The Pantera connection was more complicated and stemmed from a darker place. Chad became friends with drummer Vinnie Paul and the late guitarist Dimebag Darrell while on tour with Jerry Cantrell, and wound up working with Dimebag on a cover of Elton John's "Saturday Night's Alright For Fighting," which appeared on the "Charlie's Angels" soundtrack. After the legendary guitarist was shot and killed onstage, a devastated Kroeger wrote an aggressive song called "Side of a Bullet," as a lasting tribute to his friend. "After I put the song together, I really wanted Vinnie's blessing," Kroeger says. "So, I called him up and played the track for him over the phone. He said, 'I'd love to have you do a song about my brother.' Vinnie then sent some guitar outtakes and we pieced together a solo and put it on the song. The result is a new Dimebag Darrel solo." "Side of a Bullet" is just one of the many tracks on All The Right Reasons that's rife with compelling narrative. Ever since Kroeger started writing about his personal trials on "Never Again" and "How You Remind Me" he has strived to tell stories his fans could simultaneously relate to and be transported by. "Animals" is about a nice girl and a bad boy who get caught in the act by the girl's dad, and "Savin' Me" addresses a man in prison who wants to be saved and a fallen angel who must return to earth to be forgiven for his sins. "I really like to tell a story that comes off like a movie inside the listener's head," Kroeger says. "And I try to put myself in the scene when I'm writing it. That makes it easier for me to look around and see what I can sing about. Otherwise you don't get any details and it doesn't play out very well." One of the most personal songs on All the Right Reasons, "Photograph," is a glimpse back at Kroeger's teenage years in which he recalls his first kiss, the friends he used to hang out with and the time he got busted for breaking into his high school. "I think I just wanted to take a trip down memory lane, and I wanted to see if I had enough ideas that would make other people take that trip, too," Kroeger says. "It's so funny throughout the course of a day how many times you look back and think, "I wonder whatever happened to that one girl or I wonder if the house I grew up in is still standing.' And after people started listening to it, I was amazed how many of them thought the same thing." Like all of Nickelback's albums, All the Right Reasons was born of sincerity, emotional revelation and a genuine love for music, but this time the music also stemmed from necessity â¤“ not the necessity of making deadlines or getting albums on the shelf. Rather the necessity of an artist to create, explore and try to understand more about the world around him. Hence the album title, which was a play off the track "Fight For All the Wrong Reasons." "I really want to make music for the right reasons," Kroeger says. "The most important reason is to make music because you love it. And I think that's why we spend so much time on it. On this record, we didn't want to overlook any small detail." Throughout the creation of All the Right Reasons, the band tweaked verses, changed choruses and altered arrangements until the songs passed the band's own litmus test- no song was deemed "done" until it made the hair on the back of their necks stand up. "We're perfectionists," he says. "If you finish a song and it's not stuck in your head, then how will it stick in someone else's head when they've only heard it once or twice?" 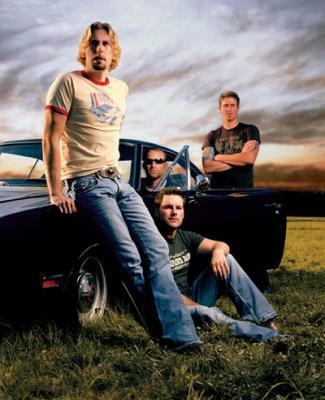 Nickelback est un groupe de néo-métal canadien, composé de Chad Kroeger (guitare/chant), Ryan Peake (guitare/chant), Mike Kroeger (basse) et de Ryan Vikedal (batterie). Le groupe fait son apparition sur la scène américaine en 2000, avec son 2ème album The State (successeur de Curb), qui connaît un gros succès. Nickelback part directement en tournée à travers les Etats-Unis, se produisant devant plus d'un million de personnes, sur un total de 200 concerts. 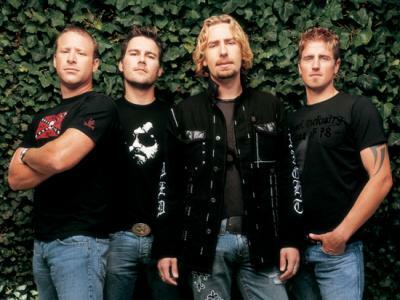 Nickelback a notamment joué avec des groupes comme Creed ou 3 Doors Down. En novembre 2001, Nickelback sort son 3ème opus Silver Side Up, qui les propulse au sommet et qui a été vendu à plus de deux millions d'exemplaires à ce jour. Ne se reposant pas sur ses lauriers, le groupe repart en tournée à travers le monde, cette fois-ci. Chad Kroeger participe, en 2002, à la BO du film Spiderman, avec le titre Hero. L'année suivante, Nickelback sort The Long Road. En 2005, après quelques petites modifications dans la composition du groupe, les Canadiens sortent l'album All the Right Reasons.